eric dyck F A l l 2 0 1 4 | w e s t w o r l d A l b e r t A 9 Alberta Around A Slice of the Slough A re the rattlesnakes found in Lethbridge's coulees poisonous, and what do you do if you come across one? How strong is the wind in Lethbridge, really? (Strong enough to make beards grow sideways and pre-empt the wearing of hats, apparently.) ey're the kinds of subjects locals know inside out – and they're fertile ground for Slaughterhouse Slough, a quirky black- and-white comic series by cartoonist Eric Dyck, who moved to Lethbridge from Moncton, New Brunswick, a year ago. "I use the comic series to look at things that people who live here experience day-to-day and take for granted," says Dyck. Why the current title? Slaughterhouse Slough was the pre-1912 name of Henderson Lake, once a leech-filled bog next to a Pat Burns slaughterhouse, and now the centrepiece of a popular city park. Dyck says he was amused that it once had such a moniker. "I also felt it represented some of the ways that cities cover up unseemly places or histories with a pretty facelift and a shiny new name," he says. Reception to the series has been positive, he adds. With every new comic, residents tell him, "Well, if you thought that was interesting, you just have to check out ...." Pick up Slaughterhouse Slough at the Lethbridge farmers' market; the Lethbridge Chapters/Indigo; or Kapow Comics, Cards and Games. 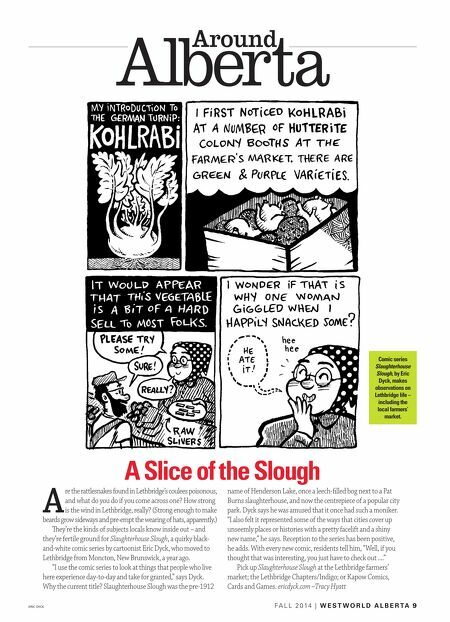 ericdyck.com –Tracy Hyatt Comic series Slaughterhouse Slough, by Eric Dyck, makes observations on Lethbridge life – including the local farmers' market.